Whether you were born in the Year of the Dragon or the Year of the Horse, celebrate a special year, your birthday, or that of a loved one with this Chinese zodiac terrarium. 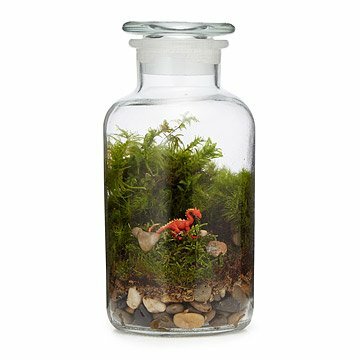 Miniature world virtuosos Michelle Inciarrano & Katy Maslow fill each glass apothecary jar with textural mosses, river stones, and rich soil, creating a beautiful, easy-care habitat for your choice of 12 Chinese zodiac figures. Choose the animal sign for the current year as a unique statement for your decor, or choose two figures to celebrate your relationship with the special rabbit, ox, or monkey in your life. Each moss-filled microcosm is assembled by hand in Brooklyn, New York. Jar made in China. Click here to learn your zodiac animal..
Keep out of direct sunlight; mist every 2 weeks or as needed. Cool Item but not worth the price. For the price of this item. I would have expected Higher care in assembly the health of Moss and the quality of Jar. This item felt like it was worth 20 dollars not over 100. Celebrate a special year, your birthday, or that of a loved one with this Chinese zodiac terrarium.